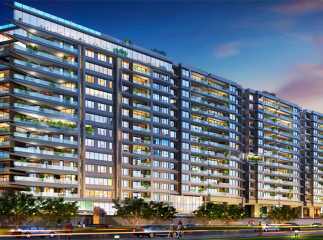 Rustomjee Elements is a prime residential property in Off Juhu Circle Mumbai. The project is spread over 3 acres, and offers unmatched luxury and style for buyers. The property has over 40,000 sq ft of theme landscaped podium garden. The complex has imported marble flooring, deck area for living room and master bedroom. It is one of the most sought after projects in Off Juhu Circle. There are luxury external and internal amenities for home buyers, indoor recreation and fitness centre that helps you relax and rejuvenate. There is a spa, games room, AV room on rooftop, and much more for buyers. There are 3 BHK, 4BHK and 5 BHK apartments in different configurations to meet the needs of home buyers. The price of the project starts at just INR 12 crores, and goes up to Rs 22.76 crores. So hurry and book your luxury home in Mumbai now.